Here's where to watch every episode of Sugarfoot season 3. Mouseover or tap an episode to see where to stream it. Click or tap the play icon to stream it on the best available service. The Trial of the Canary Kid Sep 15, 1959 Tom sets out to free his identical cousin, the Canary Kid, who is on trial for murder. The Wild Bunch Sep 29, 1959 Sugarfoot rides into Morgan's Ford, a seemingly quiet and friendly town, and takes a job as schoolteacher. He soon learns that the townspeople are fighting over water rights and living in fear of a gang of young toughs who are his pupils. MacBrewster the Bold Oct 13, 1959 The same day citizens of a rough frontier town appoint Tom Brewster as sheriff, three of Tom's relatives arrive to heap another honor on the unsuspecting cowboy. Dougal, Angus and Wee Rabbie MacBrewster have traveled from Scotland to proclaim Tom chief of their clan. 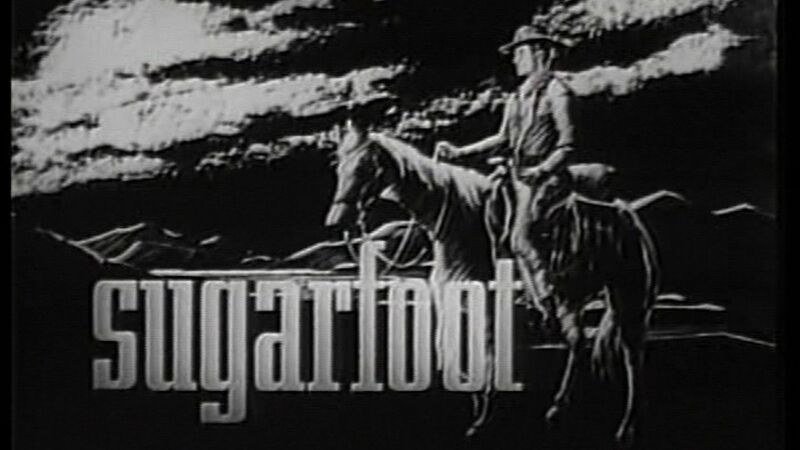 When Ben Cadigan and his gang attempt to hold up the bank, Sugarfoot's visiting relatives come to the aid of the chief. The Gitanos Oct 27, 1959 Tom Brewster rescues a Gypsy girl and soon finds that the young lady has marriage on her mind. The Gypsy chief looks on Tom with disfavor and the cowboy must contend with a vengeful Gypsy rival. The Canary Kid, Inc Nov 10, 1959 Government agent Chris Colt suspects that recent prison breaks have been supervised by the Canary Kid, an imprisoned outlaw. Colt asks Sugarfoot to take the Kid's place in prison. Outlaw Island Nov 24, 1959 Tom Brewster wants to free Sally Ormand, who is a prisoner of the Baron, ruler of an island. Learning that the islanders are ready to revolt, Tom sparks the uprising. Apollo with a Gun Dec 8, 1959 Tom Brewster is caught between a famous actress' request that he find her lost stallion, and a killer's promise of death if he does. The Gaucho Dec 22, 1959 Tom Brewster meets Curro Santiago, who is romancing Ellen Conway, despite her brother's opposition. When Santiago is held for a murder that he didn't commit, Tom tries to help his new friend. Journey to Provision Jan 5, 1960 A mayor and a sheriff offer Tom Brewster a bribe to leave town. Tom, realizing that he has been taken for a government investigator, attempts to discover what the two men are so eager to hide. The Highbinder Jan 19, 1960 An elderly Chinese masn asks Tom Brewster to help him deliver an urn containing his son's ashes to San Francisco. But the urn holds more than ashesâ€”the map of a gold mine is hidden inside. Wolfpack Feb 2, 1960 A pack of wolves kill three people, one of them a friend of Tom Brewster's. Perplexed by the incident, Tom moves in with his dead friend's family. Fernando If he defeats the boxing champ, Fernando will use his winnings to save an old mission. But Fernando and his trainer find they~ve taken on more than just a boutâ€”a local gambler is after the land the mission is built on. Blackwater Swamp Mar 1, 1960 Tom Brewster tries to bring an estranged father and son together. His efforts, however, are undermined by the father's new wife, who is willing to commit murder to get control of her husband's property. Return to Boot Hill Mar 15, 1960 Mayor Plummer agrees to help Tom Brewster clear a young man of a murder charge. But Tom gets suspicious when he learns about the mayor's connection with the defendant's sister. Vinegaroom Mar 29, 1960 Townsfolk welcome Tom Brewster to town by charging him with murder and sentencing him to the gallows. But Judge Roy Bean is a fan of actress Lily Langtry, and Tom tries to take advantage of this to save his neck. The Corsican Apr 12, 1960 Tom Brewster helps a New Englander and his daughter take a wounded Corsican to the trading post for help. But there is no assistance waitingâ€”only a warlike band of Sioux. Blue Bonnet Stray Apr 26, 1960 As the train pulls out, Tom Brewster notices that an infant is on board, but its mother is still in the station. He returns the child, unaware that he is bringing it closer to death. The Long Dry Apr 10, 1960 Jericho Dooley's town is plagued by drought. But he is determined to float off in his ark, taking Tom Brewster and Anne Carmody with him. Funeral at Forty Mile May 24, 1960 After Tom Brewster arrives in town to help his cousin run for office, strange things start happening: the local hanging tree is struck by lightning, and an empty coffin is left in the middle of the street. The Captive Locomotive Jun 7, 1960 As Sugarfoot comes on the scene, a railroad is gobbling up land in a Western valley, forcing out the landowners.